Certain we’d be attacked by multitudes of ticks, I sprayed down my pants cuffs. 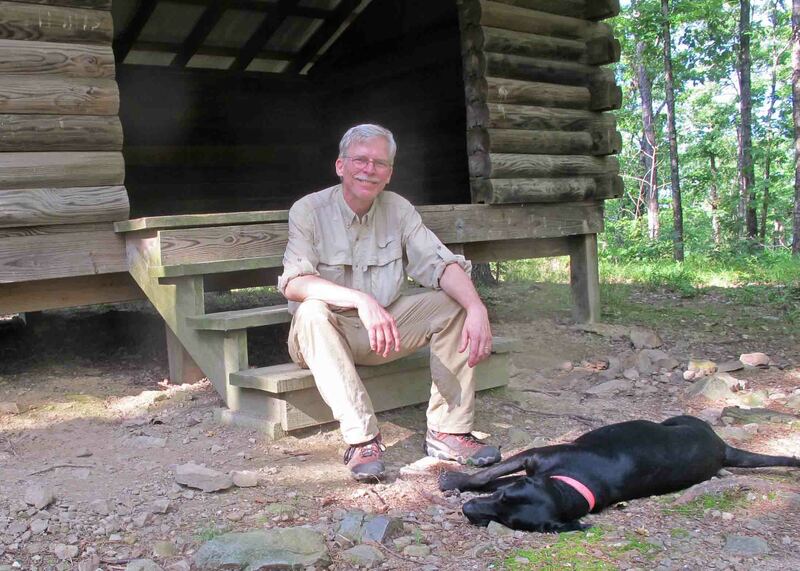 By the time Hiker (dog) and I stepped onto the Ouachita Trail at mile 165, the sun was high. I was feeling a little early trip anxiety because I was violating a long-held practice of avoiding backpacking in July. The first section is pretty exposed, allowing a lot of undergrowth, but only a few ticks managed to climb up my pants to be easily picked off. As we approached Green Thumb Spring, I wondered if there would be water. I’d packed enough to last to Crystal Prong but was concerned with having to share with Hiker if other sources were dry. 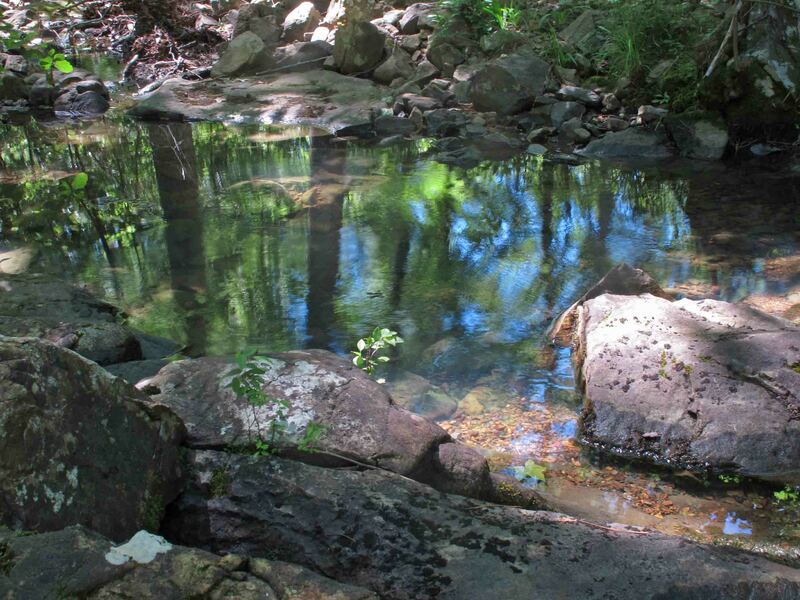 Hiker saw the water first and lowered herself slowly into the dark murky fluid with an expression of bliss. I realized the water of Green Thumb Spring was much different that what I saw there twenty years ago, probably due to the difference in seasons. There was a slow seep below the black pipe where I had filled my water pouch with crystal cold water in a few seconds years before. The bandana captured a lot of stuff that would have clogged my filter. To be safe, I decided it would be necessary to filter some of this nasty stuff. I used my bandana to filter the big stuff before using the Sawyer filter. This worked well and the water was usable. Climbing to the ridge just past Green Thumb Spring, I remembered looking to the northwest and seeing Forked Mountain many years before. I kept glancing to the left as I topped out, but the summer foliage blocked most mountain views. Still, I enjoyed the memory of my first sight of that odd shaped mountain twenty years before. Arriving at Crystal Prong was a relief. The water was clear and cool, even on July 3rd. Temperatures were in the mid to upper 80s with lows during the night around 60-degrees. It was still summer with mosquitoes and ticks. The promise of cooler temps was enough for me to make this trip if for no other reason than the novelty of backpacking Arkansas in July. I didn’t see one other backpacker during my four days on the trail. 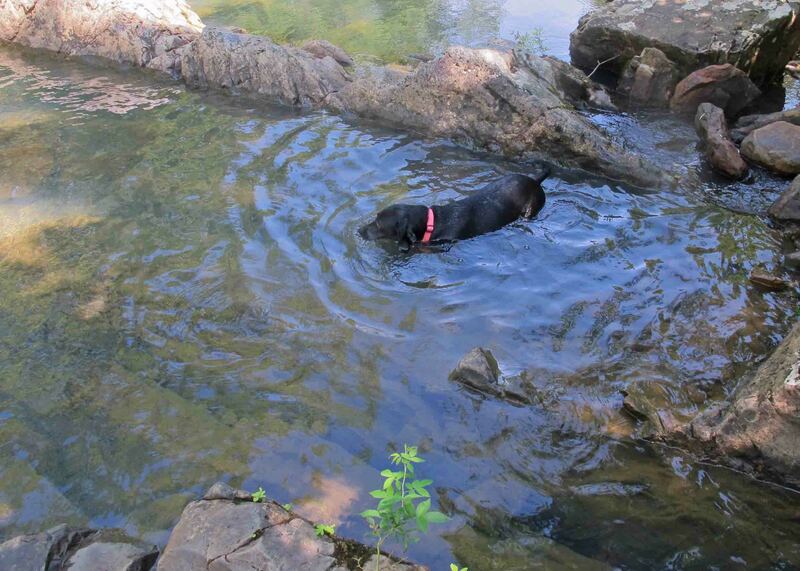 Hiker cooling down in Crystal Prong. Camping at Crystal Prong was a treat. I’d camped there with my nephew and father twenty years before. On that earlier outing, I don’t remember learning any significant outdoor skills other than to avoid getting too close to the water in winter. My nephew slipped while exploring the shore and soaked one shoe which made for some discomfort that cold evening. I learned a couple of lessons on this, my second visit to Crystal Prong in twenty years. Lesson one: The “no-see-ums” that seemed so benign were actually biting me during my evening meal. The little dots they left turned into itchy pinpoints the next day and continued to provide itchy entertainment the following week. A little repellant would have avoided this. I’ll know better next time. Lesson two: Always do a final check of your packing list. My spoon was nowhere to be found. I stirred my pasta with a stick and used a small piece of metal from my stove as a short spoon. Less than ideal but it worked. As I ate my pasta, I pictured myself drinking potato soup the next night. 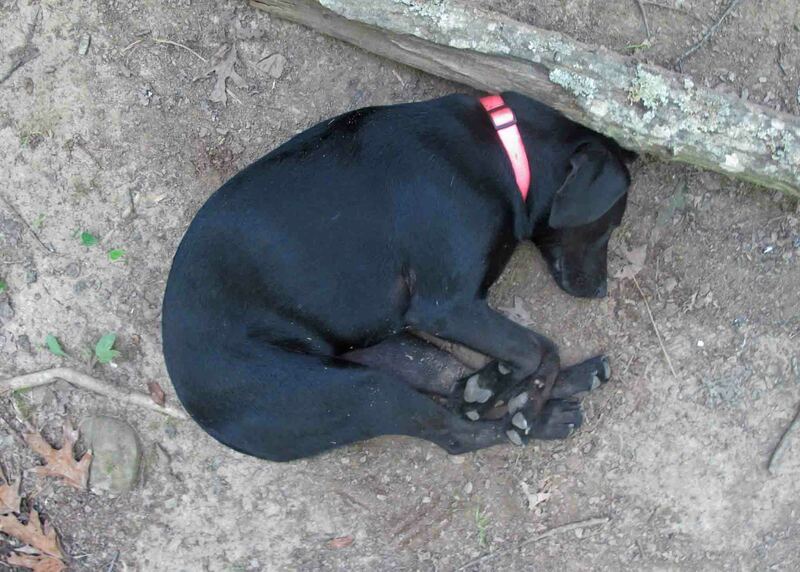 Lesson three: Hiker is a good camp guard dog. You wouldn’t think it because she’s everybody’s best friend, never growling or barking in anger. During this night, she heard a suspicious sound and gave several barks that were very different than I’d heard before. She seemed to say, “Noooo! This is our campsite. Stay away!” She also growled like I’d never heard. Whatever troubled her left the area. During the night I heard what I will call a “preachy screech owl.” The initial long high-to-low screech was followed by a series of random and rhythmic scolding hoots unlike what I’ve heard before. This occurred two times within a couple of minutes and then all was silent. Hiker didn’t react to this sound. My memory of Crystal Prong from twenty years earlier was much different than the way I found it on this trip. Still beautiful, yet different. Hiker and I took a couple of dips in the creek to cool down. The sun slowly set and stars began to peek through the darkening sky. Lightening bugs soared overhead and across the creek like our own private little campsite meteors. The next day (July 4) was a marathon hike. Crystal Prong to Lake Sylva for a little break before beginning the return trip to Brown Creek; a fifteen-mile day. We were beat so Brown Creek was a pretty sight. The water was cool and clear. The fireworks were a nice distant sound that evening and potato soup (supplemented with my dehydrated golden baby potatoes) was delicious. My newly found spoon worked well. Earlier that day we took a break at Brown Creek Shelter. I enjoy reading entries from shelter journals and sat on the steps for a while. As I was returning the notebook, I noticed a plastic Wendy’s spoon in the storage box. 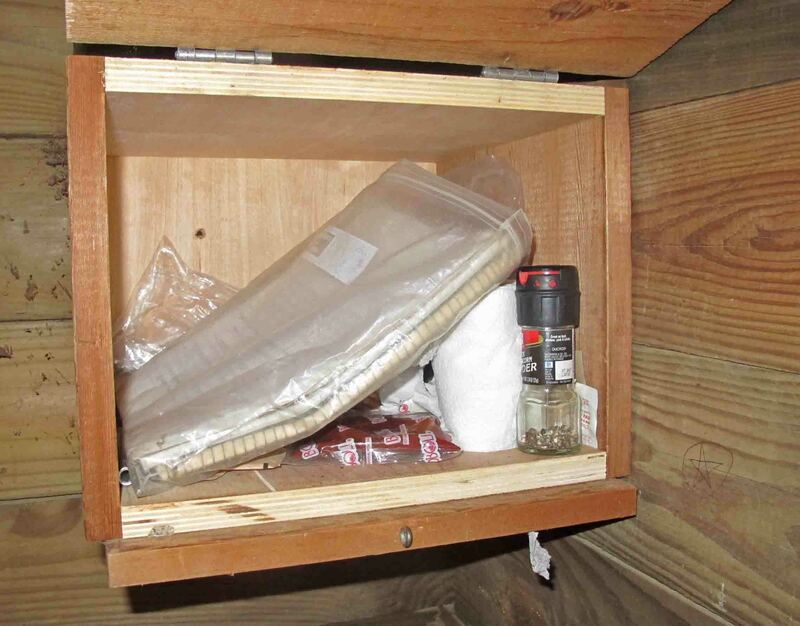 Backpackers and trail maintainers occasionally leave small items that might be of use to future hikers. I slipped the spoon into my shirt pocket and thought about creamy broccoli potato soup. Several hiking buddies call me “Tater” because of my habit of packing dehydrated potatoes. 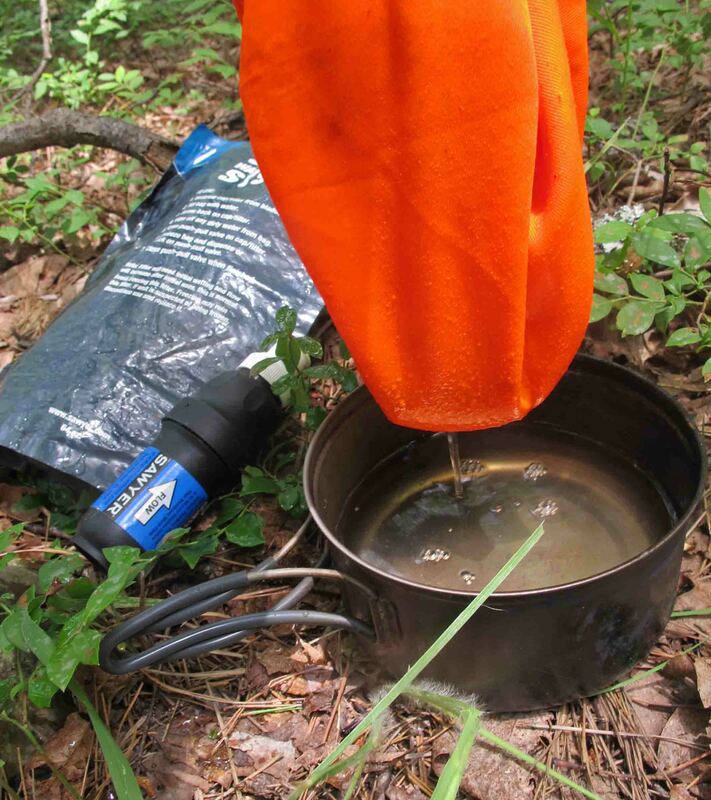 As I walked away from that shelter, I thought they might change my trail name to “Spoon.” During a winter thru-hike of the Ozark Highlands Trail, I let my plastic spoon sit on the bottom of a hot pan. By the time I smelled it the spoon was firmly melted to the pan. After prying it free and sanding it against a rock, the spoon was functional. It would have worked better if I hadn’t had any front teeth. 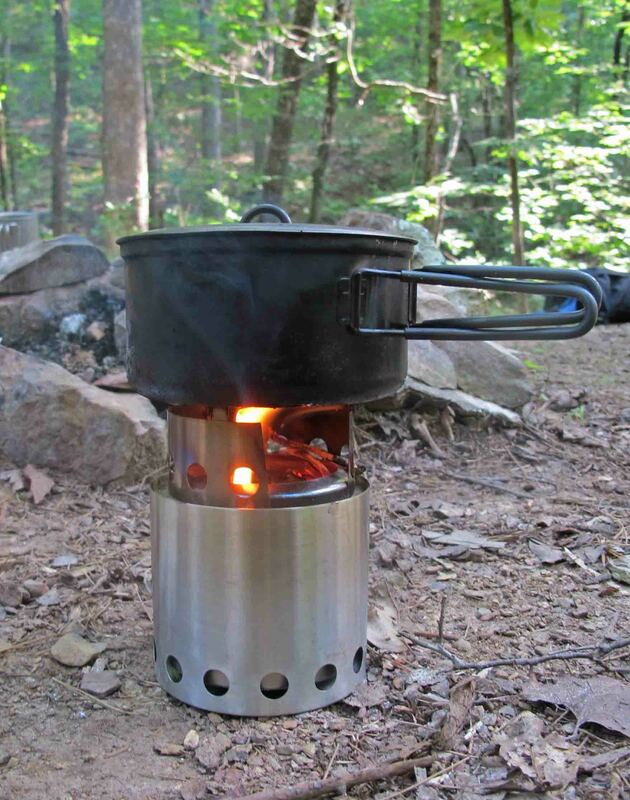 The next day we camped at Lynn Hollow and a metal spoon was at the fire ring. I still have that metal spoon. The trails seem to provide what I need when I need it, especially where eating utensils are concerned. Ummm good! 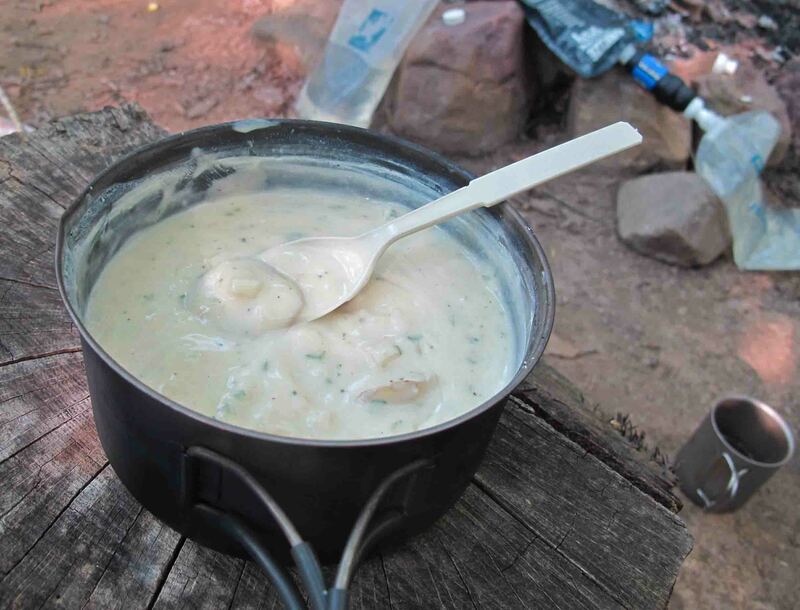 Creamy broccoli soup with dehydrated potatoes and my new spoon. Evening temperatures were cool. Originally I’d planned to use only my 2/3-length sleeping pad and silk-weight bag liner. I thought my 40-degree bag would be too warm, even if used as a quilt. Turns out that bag would have felt just right. I’d packed a light emergency bag and used it each night. I was comfortable. July 5 was to be a shorter recovery day after the previous day’s 15-mile trek. To give Hiker a break, I carried her pack but made sure she watched me stuff it into my pack as if this would increase her appreciation of the favor I was doing for her. We took our time at breakfast then started out at a leisurely pace up and out of the Brown Creek drainage. We stopped at Flatside Pinnacle and hiked up for the view. The sun was already high, but the views were a treat. We’d planned to spend the final night back at Crystal Prong but decided to hike farther to the beautiful little creek we’d enjoyed on our first day hiking in. I had entertained the idea of taking a nap there and hiking on out that same day, but Hiker convinced me to make other plans. 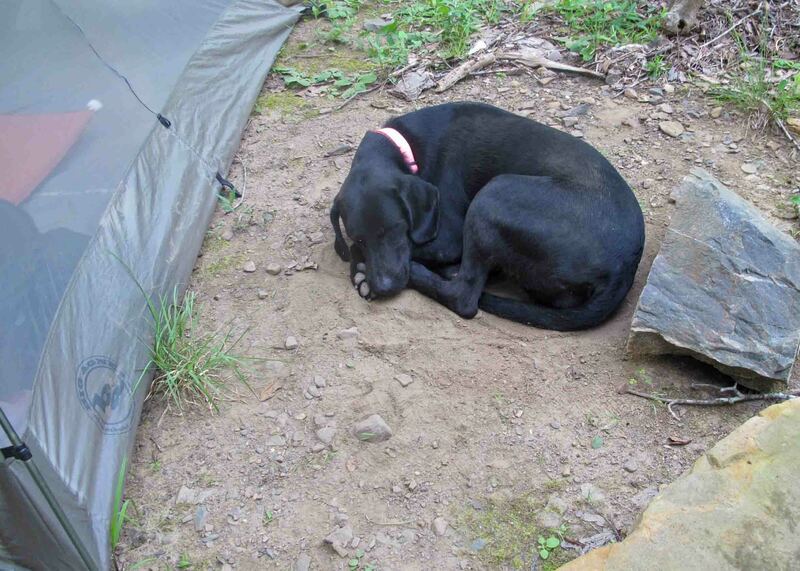 She folded and was down for a long nap while I enjoyed the water and then slept in my tent. Since we both had some good rest, I decided we’d get an early start the next morning. Sometimes dogs know best and I was wise to follow Hiker’s lead. Cool, shaded creek close to our campsite. Hiker making sure I understood we were done for the day. July 6 we rose at 4:30 a.m. and began hiking by 5:30, the first 15-minutes with headlamp. This was some pleasant hiking. The only challenge was “accepting” the occasional spiderweb. These Ouachita spiders weave a nasty web. They are spring loaded and almost push you back when you hit them. I found that it was much easier to just walk through and let them wrap around you. Then while continuing to walk, I’d pull from above and below my eyes which would remove most of the web except for my hair. This strong “spiderweb mousse” pasted my hair firmly into place. Stopping for a break at Oak Mountain Shelter with spiderwebs holding my hair firmly in place. Forty-five miles of walking on just over twenty-two miles of trail filled four wonderful days. By the time I began to backtrack our route, I was thankful that shuttle plans hadn’t worked out. Seeing the same trail in both directions gave me a better grip on this section and allowed for a more reflective walk. The memories from past treks on this same ground added a richness to the trip. You never really walk the same trail twice. Now I’m ready for some new trail! 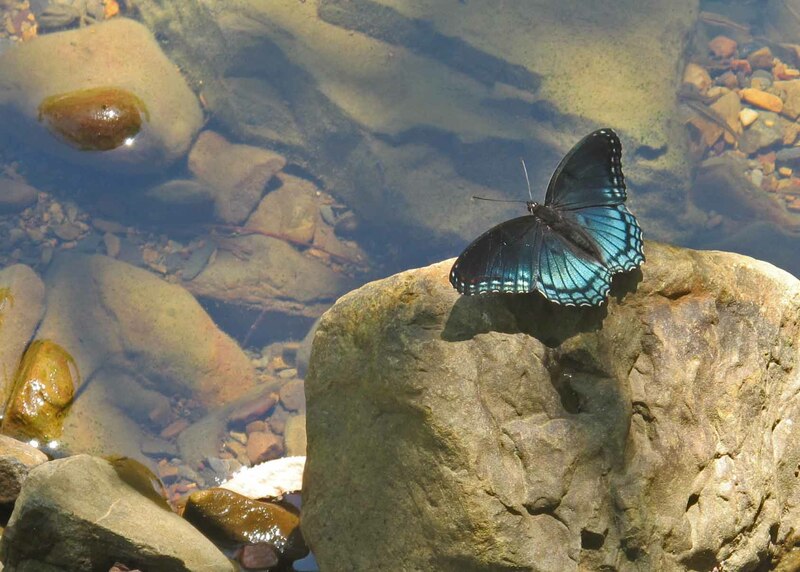 Next up when the weather cools is Lake Sylva to Pinnacle Mountain State Park. Maiden voyage with this Solo Wood Stove I picked up at Pack Rat in Fayetteville. It worked well! 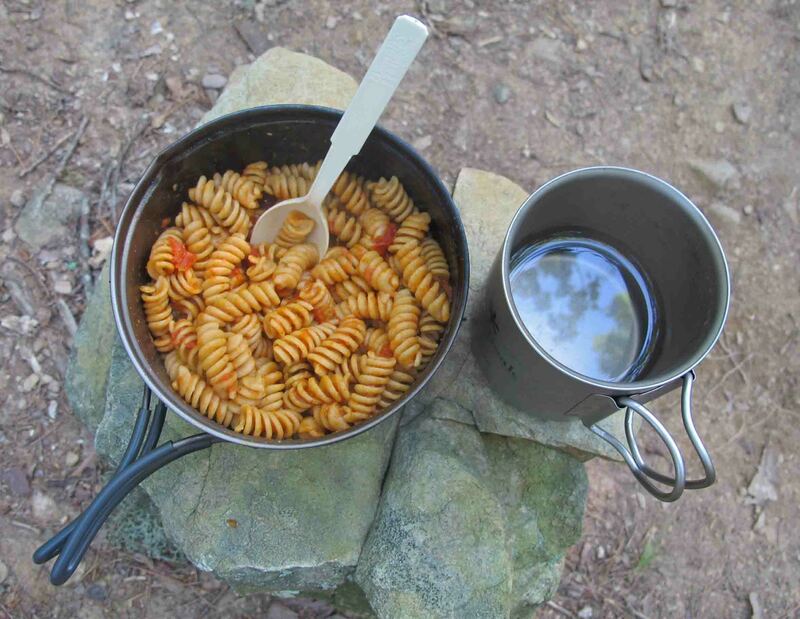 Dehydrated pasta and sauce. At home, cook the pasta about 6 minutes then dehydrate. One of my favorites on the trail! 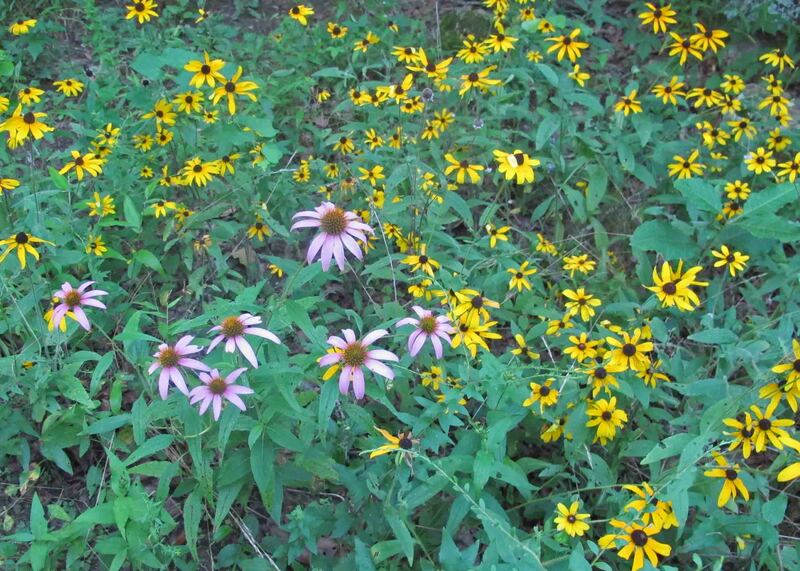 Color is a benefit of hiking in warmer weather. 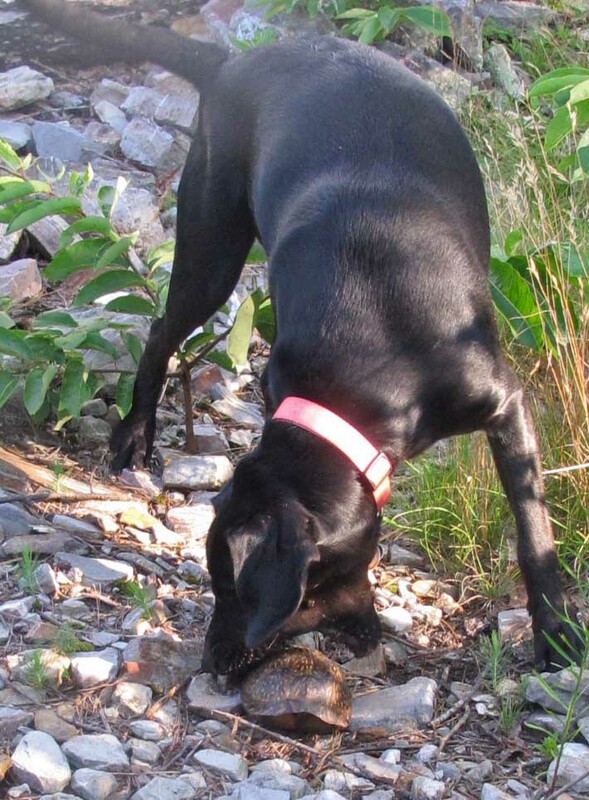 Hiker trying to carry a turtle. She gave up quickly. 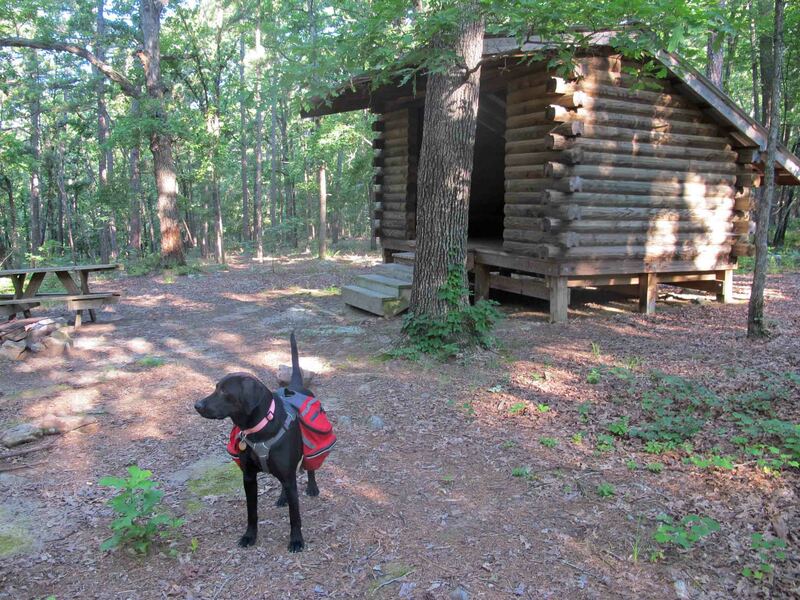 This entry was tagged Brown Mountain Shelter, Crystal Prong, Flatside Pinnacle, Flatside Wilderness Area, Green Thumb Spring, Hiker, Oak Mountain Shelter, Ouachita Trail. Bookmark the permalink. Nice pictures Jim! Thanks for sharing..
all your writing & pics are great reading. hmm… tater?? spoon?? time will tell. Sounds like a great hike. 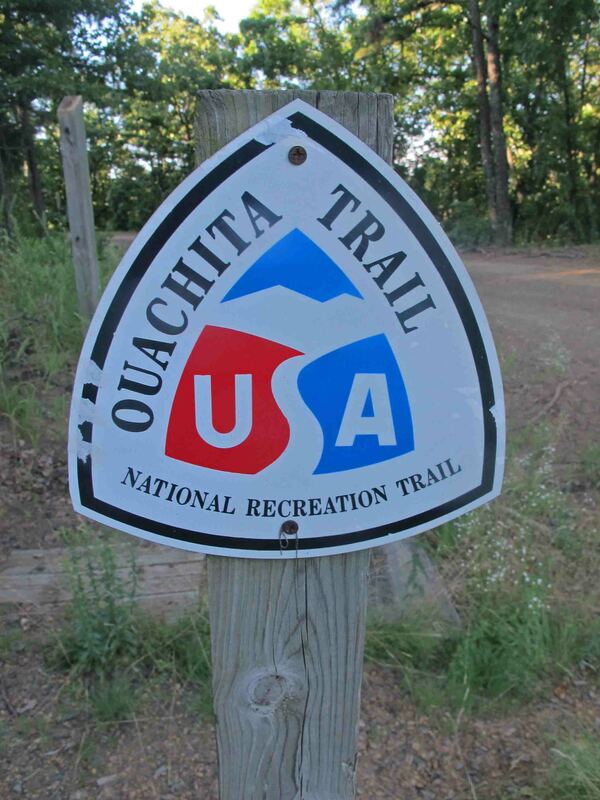 I need to hike more of the Ouachita trail. I’m really enjoying your writings. Glad I found your page! 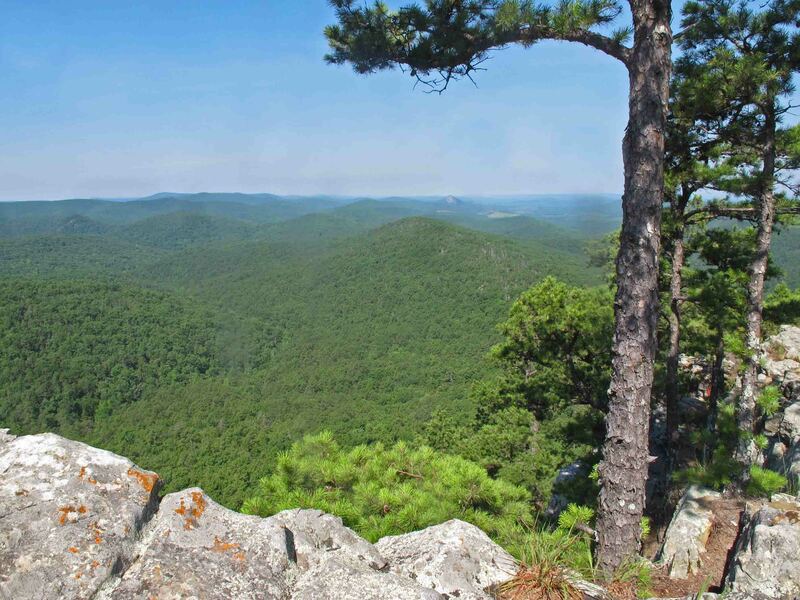 As your pictures so aptly capture, the Flatside Wilderness on the Ouachita Trail is a first class highlight of the trail. 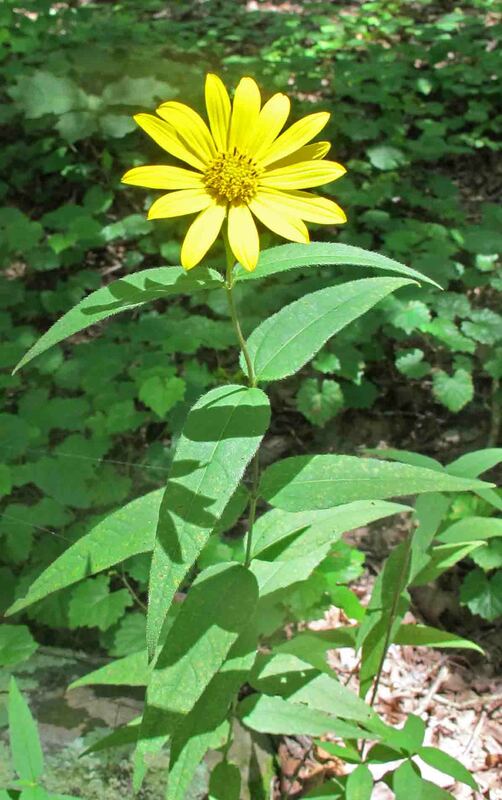 When trekking this portion of the trail, hikers should spend a little extra time, perhaps camping low (Crystal Prong) and hiking/photographing high (Flatside Pinnacle). Thanks, Jim, for your excellent write-up and photos. Thanks for reading! Appreciate all the work volunteers do to make the OT available to hikers.